So you’ve started seeing ice forming on your air conditioning unit. You’re wondering how it’s possible for it to freeze in the scorching heat of summer. This is actually quite common and there are a few potential causes to explore. The good news is that this problem can be fixed by a specialist in heating and air in Greensboro, NC. Use this troubleshooting guide to help you identify the problem. Then take any necessary steps that can be done from your end or call Berico for assistance. Low air flow. Your air conditioner requires sufficient flow of air through the system in order to work correctly. The air that comes in and goes out passes over an important part called the evaporator coil. The coil is full of refrigerant that cools air down and transfers warm air out as it passes to keep your home cool and comfortable. Clogged filters. Check your filters and replace them if necessary. Consider changing your filters monthly to achieve maximum air flow. Blocked or leaky ducts. Have a professional HVAC company check your ductwork for any blockages or leaks that may be interfering with proper air flow through your system. Blower failure. If the blower is not properly moving air over the evaporator coil, it can cause ice to form. Low refrigerant. The evaporator coil must contain a very specific amount of refrigerant to properly cool incoming air and remove heat from outgoing air. If there is not enough refrigerant, it can cause your AC to freeze up. Leaky coil. If there is a leak somewhere in the coil, the refrigerant level will be too low to transfer heat out and cool down the incoming air. Refrigerant line kinks or leaks. If there are any leaks in your system where refrigerant is getting out, or if there is a kink in the refrigerant line, it leads to an insufficient amount of refrigerant in the coil. If you notice ice anywhere on your air conditioning unit, the only action to take on your own would be checking and changing your filters. Any other repairs should be handled by a professional HVAC service. Berico is a trusted name in heating and cooling services in Greensboro and the surrounding area and has been for decades. A frozen outdoor unit is a common problem with air conditioners, but it can be prevented with regular yearly maintenance. An AC tune up includes filter replacement, refrigerant charging, blower and ductwork inspection and repair, and more. 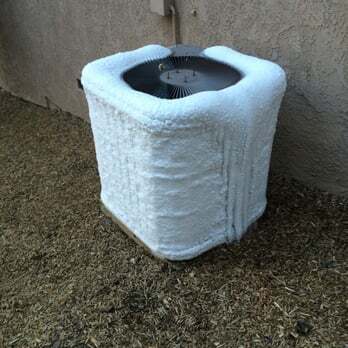 A frozen AC unit is just one of many common problems that can be prevented with regular tune ups. Sign up for Berico’s Comfort and Protection Service Agreement and breathe easy knowing your system is in good hands. Call (336) 273-8663 for repairs or maintenance today.